Troy on the day he was rescued. 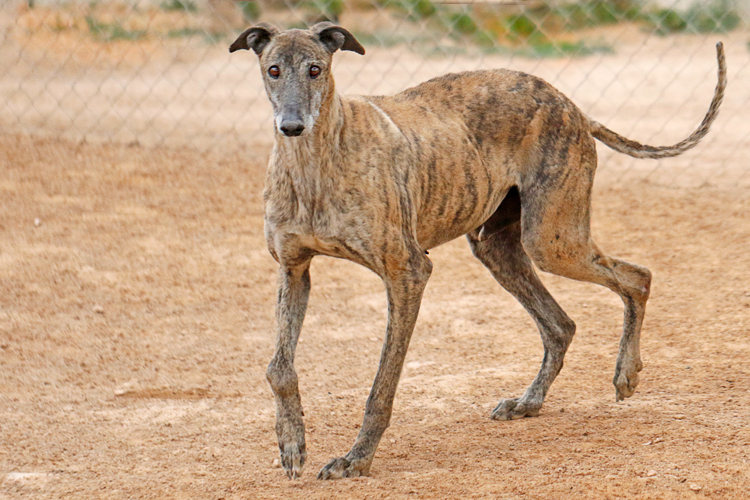 Troy has been at GDS since February 2016. UPDATE FROM TINA — Troy, what happened to you that left you so traumatised? Troy is now at the retirement residence where we are making some good progress. It’s very up and down but it’s progress all the same. Troy has a line attached to him the whole time because it’s very hard to get a lead on and off him without him freaking out and getting aggressive out of fear. With this lead (it’s cut so can’t attach to anything putting him in danger), I can just pick it up safely and have been able to guide him out to the garden for toilet breaks which he does but then wants to swiftly get back to his safe place. The breaks on the lead are getting less and less stressful. I would love to keep Troy here until he finds a new home but there are a few barriers. He really struggles on our tiles which scares him when he slips. We have put down temporary flooring but it’s hard to cover the whole house and as soon as my neighbours come back I will need to reduce the number of dogs here as they complain. Troy will be one that goes back to the Center as the others are permanent residents. Troy needs to go straight to a home where he can continue this kind of work. He isn’t able to progress with the amount of activity in the kennels, it’s just not for him. This is the first time in three years we’ve been able to walk him on a lead. This boy can not go back to the Center. Troy was the most terrified of the Sensitive Seven who were rescued from a horrendous situation where the animal police were called in to remove dogs kept in miserable conditions. GDS was called on to help and of course we accepted the challenge. Unused to human touch or kindness, the dogs were very skittish at first but are gradually coming around and beginning to seek comfort from the GDS staff. Troy was completely overcome with fear when Tina approached him in the finca where the dogs had been kept. His fear progressed into a full blown panic attack and he had to be hospitalized. Tina and the staff have been working with him steadily to become comfortable with human touch and presence. Yes, I am interested in sponsoring or adopting Troy!